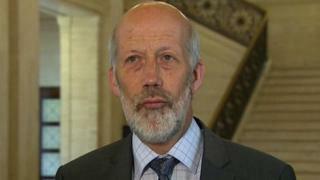 Former justice minister David Ford's abortion bill is to begin its passage through the Northern Ireland Assembly later. The private bill seeks to legalise abortion in cases of fatal foetal abnormalities. If passed, it would enable women in that situation to access a legal termination in Northern Ireland. It follows a previous attempt by Mr Ford to change the law while justice minister. The next stage will take place in the new year. In February, MLAs voted against legalising abortion in cases of fatal foetal abnormality.